Vivarium Tank: What are the Best Enclosure Options? Vivarium Tank: What are the Enclosure Options? The first thing you’ll need when constructing a vivarium is some type of enclosure. There are a number of different vivarium tank options available, and each one presents its own strengths and weaknesses – no single style is universally appropriate. In this article, I describe some of the most common enclosure types used by herpetoculturists. I will also explain which tank is the best option for a tropical vivarium. Glass tanks are one of the most popular enclosure types for vivaria, and it is easy to see why. They are usually inexpensive, they provide very good visibility of the occupants and most are designed to hold water. However, they also have a number of drawbacks, which you should carefully consider before deciding on an enclosure. For example, glass tanks are very heavy for their size. This isn’t a huge problem for a 10-gallon tank. But it becomes a significant challenge when you start considering tanks with 50- to 250-gallon capacities. Additionally, glass is difficult to keep clean – particularly when it is used for vivaria containing wall-clinging geckos or frogs. Many glass enclosures are also designed specifically for fish and feature a very long, yet narrow footprint. This may be acceptable for geckos and tree frogs, but terrestrial herps require less enclosure height and a more spacious footprint. Traditional glass tanks are also top-opening enclosures. This is less-than-ideal, as it requires you to remove the lights anytime you have to feed your pets, inspect them or access the vivarium in any way. Top-opening tanks do, however, offer much easier access to the cracks and crevices of the tank. Finally, glass tanks are obviously quite fragile. This not only means that you’ll have to be extremely careful when cleaning or moving the enclosure. It also means that you or your pet may suffer serious injuries if the habitat does break. These glass boxes are often called aquariums in the pet trade. But they don’t technically become such until they’re filled with water. They could just as easily be used to create a terrarium or paludarium. Commercial reptile enclosures can be made from a variety of materials, but most are constructed from PVC or ABS plastic. These types of enclosures have become quite popular in the last decade or two. But like glass tanks, they have strengths and weaknesses. For starters, commercial reptile and amphibian enclosures are usually more expensive than many other types of enclosures. This price discrepancy is most pronounced for relatively small enclosures. But even the largest plastic enclosures are generally more expensive than their glass counterparts. Plastic enclosures rarely offer the visibility that glass tanks do. Although there are some exceptions and some commercially produced cages are even made from glass. But most feature a single viewing window. You can, however, drill through the sides of most commercial habitats, to allow for cords and pipes to pass through the walls. Plastic enclosures do offer the inhabitants more privacy than glass tanks do, which is helpful for those keeping shy species. Additionally, commercially produced plastic enclosures are generally lighter than glass tanks of the same size. Wooden cages have a few significant downsides, so they aren’t as commonly used as glass tanks or plastic enclosures are. However, in some situations, they can still be a viable option. Wooden cages are typically pretty affordable (although this can vary based on the craftsmanship and features involved in the construction). They also retain heat better than glass or plastic enclosures do, which is helpful for those keeping species that require very high temperatures. It is also easy to drill through wooden enclosure walls or attach perches and other items to the walls. The single biggest drawback to wooden cages is their tendency to absorb moisture. When moisture seeps into the wooden floor or walls of an enclosure, it causes the fibers to swell and eventually rot. This will ultimately ruin the habitat and render it unsuitable for use. Most wooden enclosures are coated with some type of water-proofing agent or sealant, but these products vary in their efficacy. Marine-grade paints, for example, are often very effective and can render a wooden habitat nearly as waterproof as a glass tank. However, few of the economically priced sealants sold at hardware stores will work this effectively. Some wooden cage makers cover the wood with plastic coatings, but this increases the price significantly. Screened enclosures are very effective for some reptiles and amphibians, and they provide a number of important benefits. They’re usually quite affordable, and you may even be able to make one yourself. Nevertheless, they are completely unsuitable for many of the most commonly kept reptiles and amphibians. Fundamentally, screened enclosures provide a lot of ventilation and air exchange with the surrounding room. This is very helpful when maintaining some herps, such as chameleons. But it also means that these habitats are harder to keep warm. The high levels of air exchange also prevent keepers from maintaining a high humidity level inside the enclosure. The visibility provided by screened enclosures is also a bit limited. While you can theoretically view your animal from any of several directions, you won’t be able to see your pet as well as you would through a glass or acrylic window. However, screened enclosures do offer a few unique benefits. For example, the side walls of such habitats are often more forgiving than the walls of glass, plastic or wood cages. This can help prevent injuries in animals like basilisks, who often run full speed into the walls of their habitats when startled. Screen enclosures are also very light, which makes them easy to move around. In fact, most are easy to completely disassemble, making them somewhat portable. Because we’re focusing on the creation and setup of a rainforest terrarium, a glass tank or plastic commercial enclosure will be the best pick. I am not suggesting that wooden enclosures and screened cages cannot be used for rainforest vivaria (I have set up rainforest-style habitats using both), but they are certainly not ideal. Glass tanks and plastic enclosures, on the other hand, are excellent choices for rainforest vivaria. Then make it easy to achieve a high internal humidity, and they are built from materials that will not become damaged from constantly damp conditions. 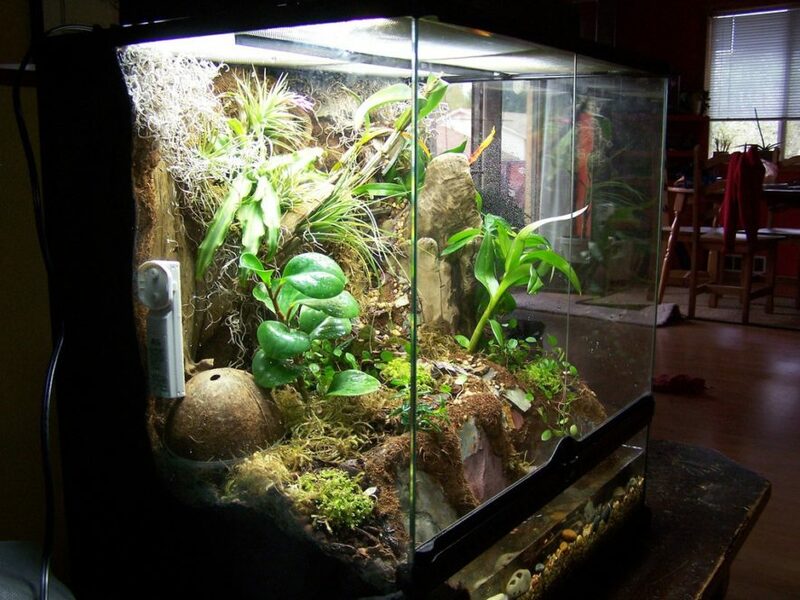 You could even include a water feature in these types of enclosures, thereby turning your terrarium into a paludarium. Glass tanks will provide much better visibility of the habitat and inhabitants, but this may stress nervous creatures. Accordingly, you’ll want to be sure to provide plenty of visual barriers and hiding places to give your pet the security it needs. The biggest challenge you’ll face is installing heaters or water pumps. Often, you’ll find it necessary to alter the screen top or make your own custom top. It will provide a place through which you can route electric cords and tubing. You’ll also be forced to use adhesives and ingenuity when hanging perches or plants, rather than screw-in hooks and similar types of hardware. Silicone is typically one of the go-to adhesives for mounting cork bark or other backing materials, although it does not work well with all materials. This means you may have to experiment with other types of adhesives until you find one that bonds to both glass or plastic and the material you are trying to mount. Just be sure to select a non-toxic product that is clearly labeled as being safe for fish and animals. Pick a tank or enclosure that is as large as possible. Too often, first-time vivaria builders end up overcrowding the habitat by placing too many plants, branches, rocks and other things inside. This can not only make the habitat inappropriate for the inhabitants, it looks bad too. So, remember that the enclosure must not only be large enough to accommodate your pet(s), it must also be large enough to accommodate the plants and decorations you intend to put inside as well. As a rule of thumb, try to select a habitat that is twice as big as your pets require. Let us know what is your favorite type of enclosure in the comments. Also, be free to ask any question you may have about vivarium tanks. Also, if you found this article helpful, go ahead and share it with your reptile- and amphibian-keeping friends.